Andrew won the starter sprint event in 45.20 on the Saturday (200m swim, 500m steep uphill transition, 13km bike and 2km run), which he did as a warm up. He then tackled the Olympic Distance Triathlon on the Sunday. 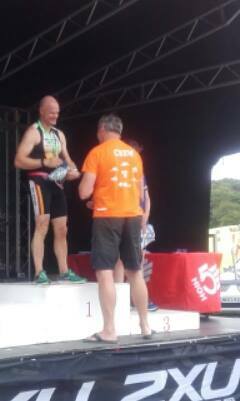 This comprised a 1500m swim, a scenic 45km bike ride, and a brutal 10km run in the heat, which he completed in 3.01.59, placing 35th in his age group.Having competed at the Cholmondeley Castle Triathlon event in June, Andrew Biggs went to Yorkshire to the Castle Howard event on the weekend of the 21st/22nd July. 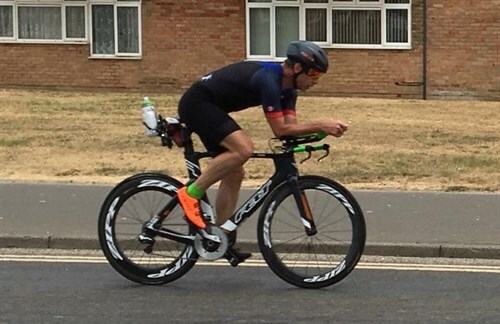 Doug Mac Taggart described some of his training for the Maastricht Triathlon which takes place on the 5th August. 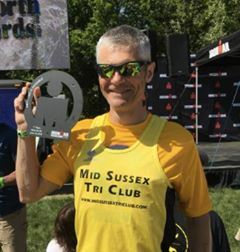 On the weekend of the 21st/22nd July he completed an Olympic Distance Triathlon in 2.45, followed by the Lunartic Night Trail Marathon at Shoreham in 4:45. He would then have a 2 week taper before going to the prestigious Maastricht Ironman event. 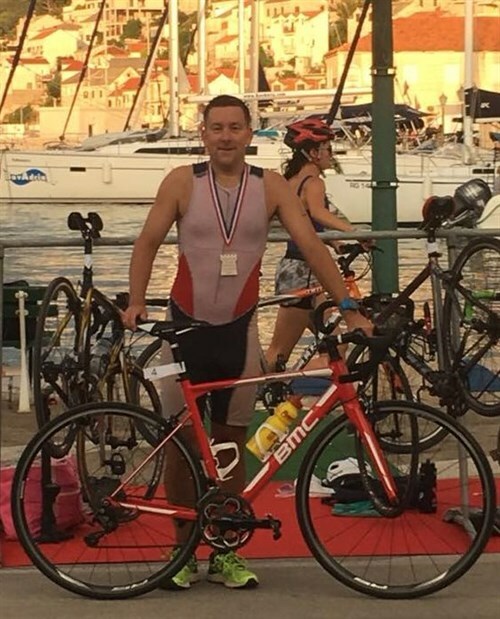 Adam Cameron-James joined in the enthusiasm of club members about competing internationally, by entering the Triathlon Pucisca, for the second time, on Saturday 28th July on the Island of Brac on the Adriatic coast of Croatia. The event consists of a 400m sea swim, followed by an 11km cycle route on steep gravel roads and a 3.5km run on the asphalt roads and stone steps of the town. The event started at 6pm to avoid the hottest part of the day. Adam commented that although it was very scenic, it was also the most brutal triathlon that he has ever done, with 1000m of climbing on a mountain bike and 150 steps to run up, all in 33C heat. 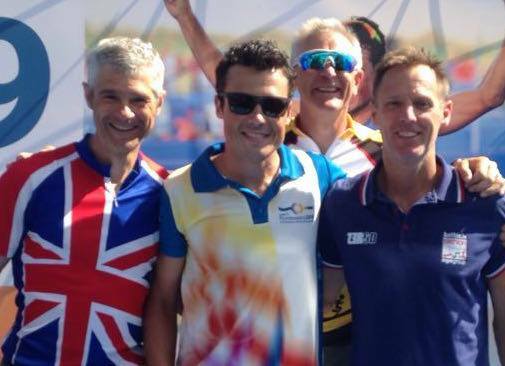 Mark Jordan and Jim Graham from Mid Sussex Triathlon Club were delighted to both finish as top GB athletes in their events amid a large GB age-group team. It was a wonderful boost to shake hands with Gomez, a true great. Mark was fast on both swim and bike to finish 5th in the world in the 60-64 Aquabike category. This terrific result was despite a chronic ear infection. Mark's pain and deafness was remedied within 24 hours of his return to UK by an emergency appointment procedure by top Sussex ENT surgeon, Mr Prodip Das. 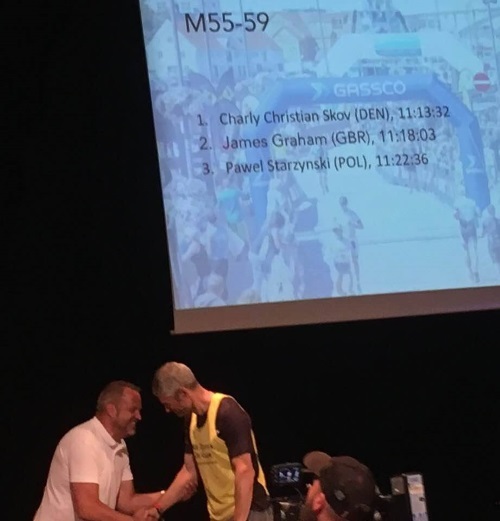 Jim had a slow swim as usual but strong cycling and the 2nd fastest run in age group lead to an 8th in the world finish in the 55-59 Long Distance Triathlon Category. 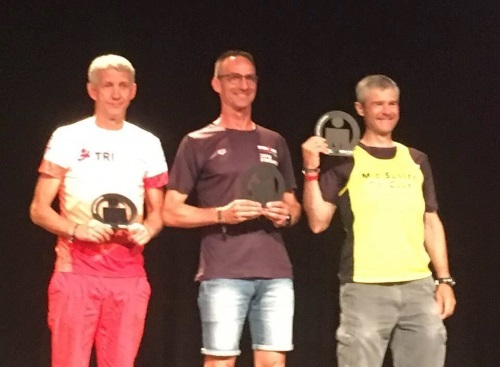 A weak run at Ironman Norway 2 weeks earlier made him narrowly miss 1st place, but this time there was a steady 7:30 minute/mile pace throughout plus a good sprint finish. 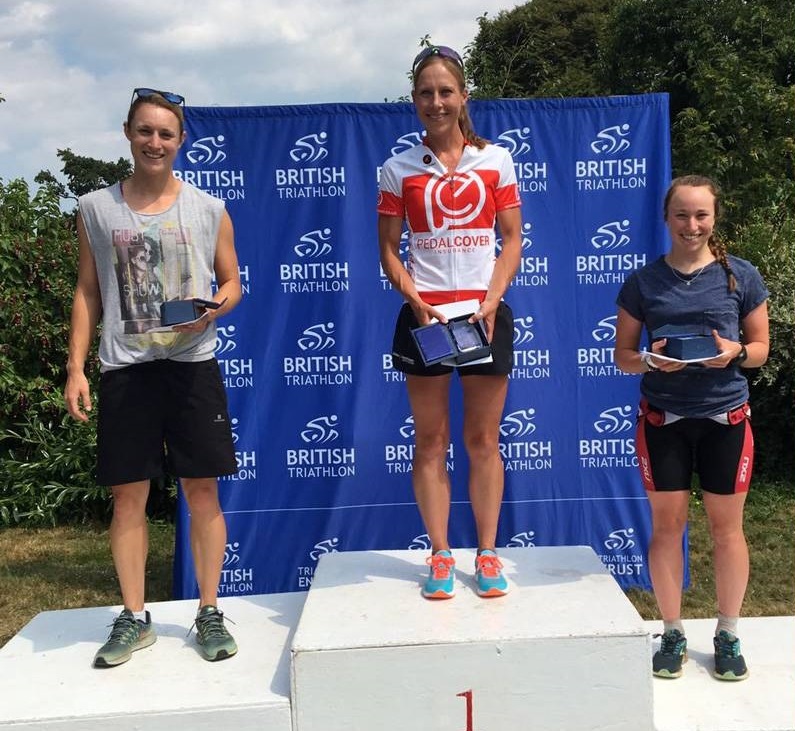 Mid Sussex Triathlon Club Member Kate Mactear, who is studying for a Masters Degree at Bristol University, achieved a magnificent 3rd place with a time of 5.19.47 in the British Middle Distance Championships held within the Festival of Endurance Gauntlet event at Hever Castle. This is an event in the popular Castle Triathlon Series and involves a 1.9km swim in Hever Lake followed by a tough 90km bike ride round the High Weald of Kent anf the Ashdown Forest, and finishing with a 21km run with a challenging off road element. 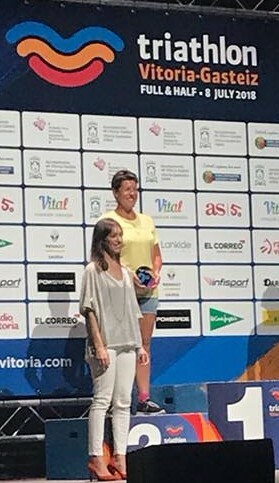 New member Amanda Hyatt achieved 2nd place in her age group with a time of 7.21.11 in this popular event held in the Capital of the Basque Autonomous Community in Northern Spain. It comprised a 1.9km swim in Ullibarri-Gamboa lake, a 94km bike ride around the beautiful landscape of Alava, and finishing with a 21km run through the medieval town. 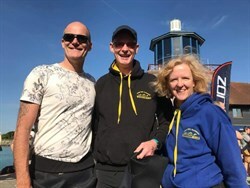 Amanda commented that the club's open water swimming sessions at Ardingly Reservoir had given her the confidence to tackle the swimming part of the event. 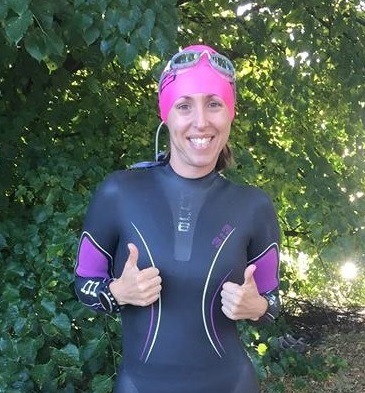 Emma Jayne Smith took on her first Standard Distance Triathlon at Thorpe Park (1.5km swim, 40km bike, 10km run) finishing in 3.27.36. She commented that it had a nice course, was well organised and very enjoyable. The inaugural full ironman in Norway took place on 1st July during unusually hot dry sunny conditions. There were less than 600 athletes doing the full 140.6 mile race which occurred simultaneously with the 70.3 race. At the start of the year, this Norway race had been my main target to win an Ironman Kona slot, with Ironman Boulder in Colorado three weeks earlier as the tune-up race. I was fortunate enough to get a Kona slot at Boulder so this visit to Norway became the tune-up race for the ITU World Championship in Denmark two weeks afterwards. The lake swim at Haugesund was a relatively cool 18 degrees and produced a surprisingly frequent number of contacts with other swimmers despite the rolling start and small starter list. The swim was well organised with a novel system of swim lanes within the lake so it was impossible to go off course by very much. My 1:28 swim was typical of recent times and one of the slowest in age group. This is possibly my best ever cycling experience and a top personal performance. The conditions were perfect with closed dry roads on a breathtakingly beautiful but challenging hilly technical single loop 112 mile course with constant turns and switch-backs. If I had previously cycled the course, I could have cycled 10 minutes quicker because of less braking and choosing better lines to take corners at speed. Several sections were like a roller-coaster ride with 40mph descents approaching bends in the road then steep climbs that momentum could carry you up if you held your nerve. My 5:33 cycle was 22 minutes faster than the next best in my age group, but I had no notion of this when I started the run. I had no idea that I was in the lead for most of the run and I frittered away a 13 minute advantage by failing to dig deep in the second half. My 4:07 run was 15 minutes slower than my typical Ironman run and I finished 2nd in age group having been beaten by 4 minutes 31 seconds. It was a very pleasant surprise to appear on an Ironman podium for the second time within 3 weeks. My overall finish time of 11:18:03 is not particularly fast but the challenging bike course and the hot conditions for the run caused everyone to slow down. Having been middle of the pack for most of the other 20 Ironman races since my first one in 2009, this 2nd place in age group at Ironman Norway is more than I could have hoped for. That altitude training in Colorado a few weeks earlier seems to have worked but sadly it will just be a temporary effect. Lack of mental strength may have cost me 1st place in age group in this race as a little voice in my head may have been telling me to save something for the ITU Long Distance World Championship in Denmark two weeks after. Jim Graham continued his worldwide Ironman and Marathon experiences in this high altitude event held at 5000ft. He had made meticulous preparations for this event, with every detail addressed, with the aim of securing a Kona qualification for 2018. Kona is the Ironman Championships in Hawaii. At the Boulder event, after a slow swim, Jim did well on on the moderately hilly bike route, averaging 22.5mph, with his home-made bike, put together mostly with second hand parts, proving to be very aero, and held his form in the run, despite 100F temperatures, to come in overall 1st in his age group in 10.39. This performance gives him a slot medal for the Ironman World Championships in Kona, Hawaii, later in the year. Jim said that this achievement was "a dream come true", "unbelieveable" since previously he had never ranked better than 5th in his age group, having completed 22 Ironman distance events over the last 9 years. Jim expressed his gratitude for all the terrific support from friends, family and colleagues, and said that " Kona promises to be awesome." You can read Jim's full race report here. 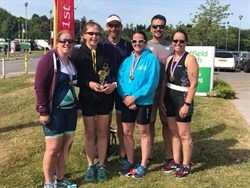 It was a busy weekend for members who were competing in Triathlons of varying lengths and also for 16 members who took part the River Arun Swim. Rachael Baker won the women's race, with Rob Hoodless coming 3rd in the men's race. Sarah Hinton, Clair Hunt, Rebecca Moore also took part. This is a 3.8km swim from Ford to Littlehampton. Steve McMenamin was the 1st member to finish in 48.46 (4.68 km/hr), with Mike Jaffe 2nd in 50.45 and Jo Fleming 3rd in 53.34. Joanne Barton was the first woman member to finish in 55.28 (4.11km/hr), with Tiggy Rose 2nd in 55.54, and Merrin Forbes the 3rd member to finish in 58.15. 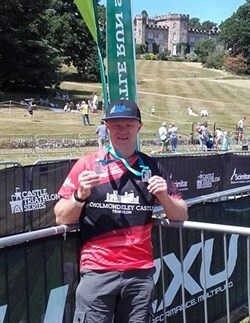 Andrew Biggs went to Cheshire for this Castle Triathlon Series event. He did the sprint plus event on Saturday, finishing the 800m swim, 44km bike and 8km run in 2.20.10, and then did the Standard Distance event on Sunday, completing the 1500m swim, 44km bike and 10km run in a very respectable 2.47. Lawrence Wintergold came 3rd in his age group in the Standard Distance Event in 2.23.22. Jane Faulkner also took part, finishing in 3.33.19. Adam Bryant competed in the sprint event, finishing in 1.48.08.